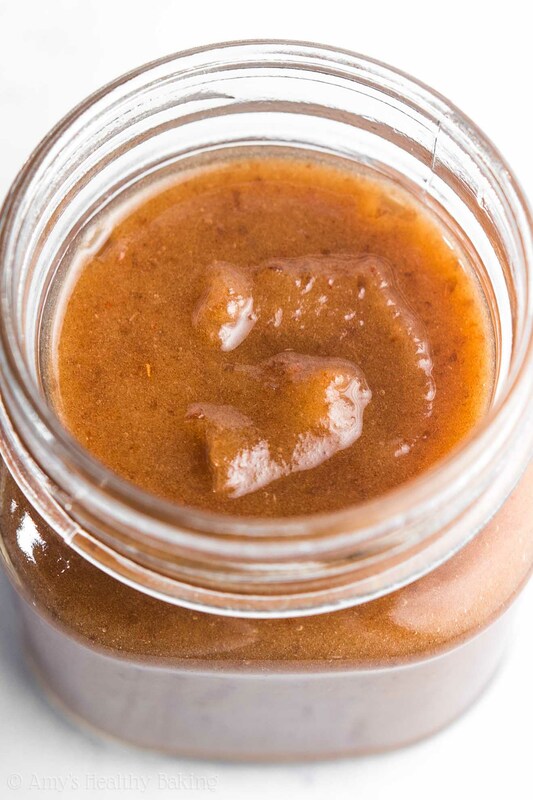 A quick & easy recipe for skinny caramel sauce that contains NO butter, sugar or heavy cream! 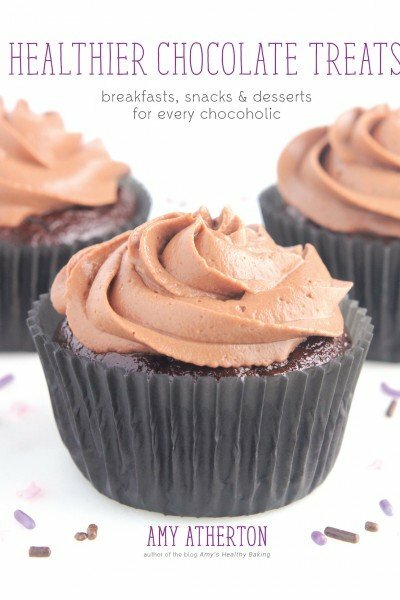 You’ll want to eat it straight from the jar with a spoon! While on a walk last week, my mind wandered off to brainstorming recipe ideas, as it often does when it’s sunny and warm outside, to create for you. Something about those golden rays of sunshine seem to get my creative juices flowing much faster compared to when I’m sitting inside at my desk! 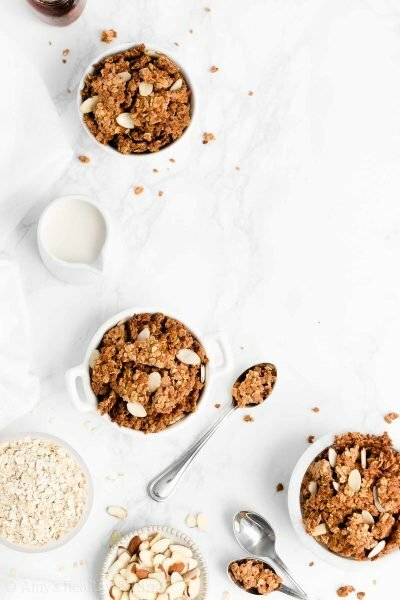 Last month when I asked you on Facebook, “Carrot cake: yay –OR– nay?” I received almost a unanimous response of YAY (and yes, many of the answers in all caps, just like that!). With carrot cake as a very close second behind chocolate for me—and with that margin shrinking every year!—reading all of your yay’s made me incredibly happy, so I plan on posting quite a few fun carrot cake treats in the next few weeks! 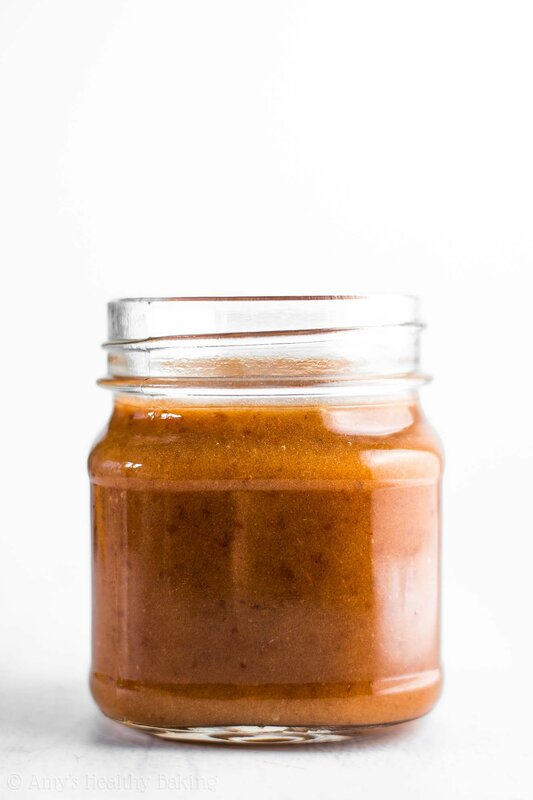 But since it seems a little silly to start giving you Easter recipes the morning after Valentine’s Day while leftover sugar cookies and dark chocolate truffles still sit in my kitchen, I wanted to share something else that I thought of while on that walk first: this Healthy Two-Ingredient Caramel Sauce. 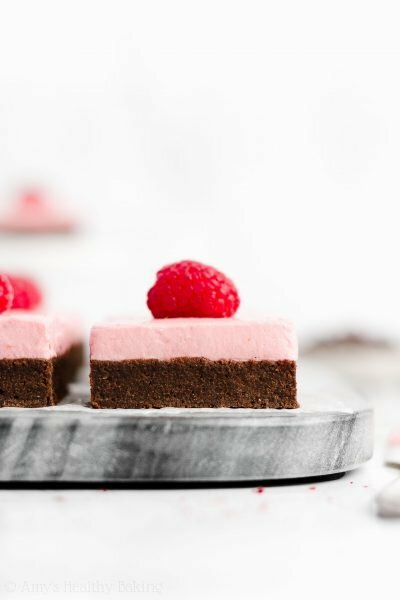 It’s incredibly easy and doesn’t require any butter, sugar or heavy cream! But it’s true! 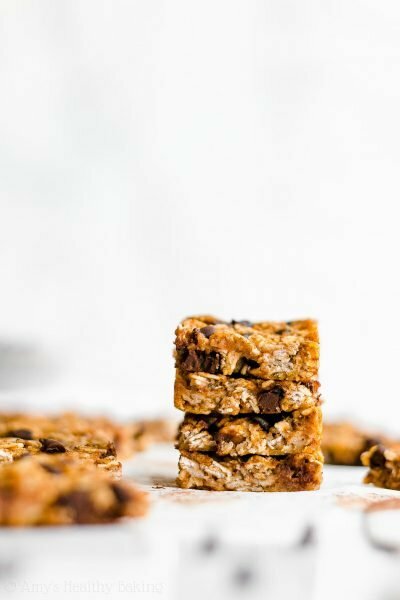 The only two ingredients you need are medjool dates and water. And I guarantee you already have the latter at your house! Compared to other varieties of dates, medjool dates are slightly larger, really soft, and contain a very sweet caramel-like flavor. 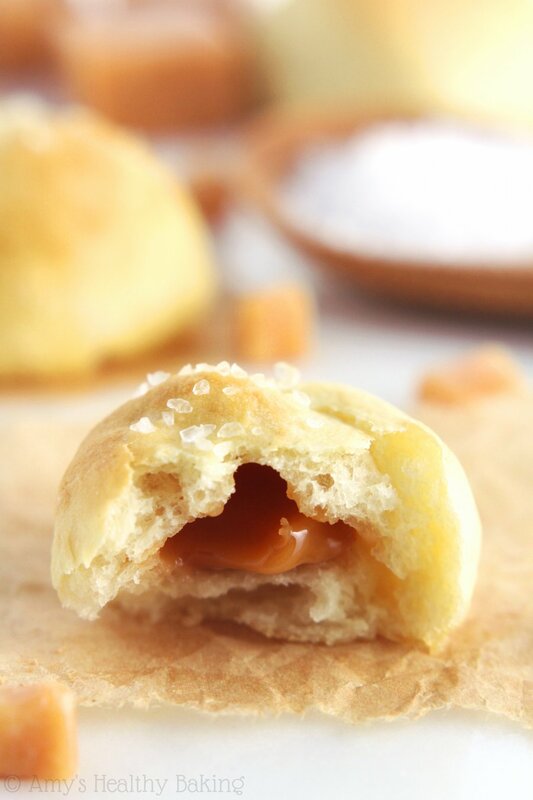 That makes them perfect for this easy caramel sauce! You’ll want to use fresh medjool dates, which are found in the regular produce section of the grocery store. (Skip the dried kind; they’re just a tad bit too tough!) My local supermarket stocked a few different sized plastic packages right next to the bananas, but since none of them were already pitted, I had to remove the pits myself at home. No big deal! 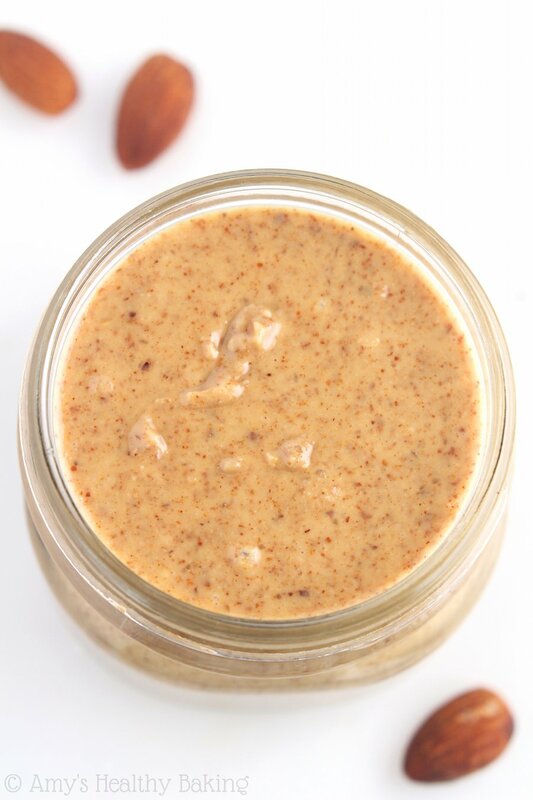 Simply add the pitted dates to a blender or food processor, and gradually add the water a few tablespoons at a time until a smooth sauce forms. I love and highly recommend this Ninja that I own! 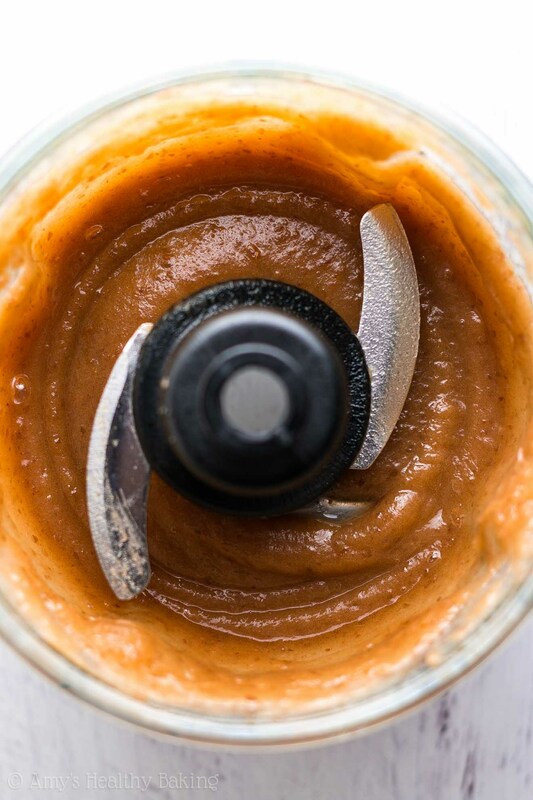 It’s really affordable for a high-powered blender and food processor, and both of those come with very sharp blades, which really help make the caramel sauce as smooth as possible with basically no lingering chunks of date skin. Doesn’t that look deliciously creamy? Because I brainstormed a few other really exciting things I want to share with you on that walk, I’m taking the rest of this week off from posting recipes to work on those. But I’ll be back next Monday with lots of delicious treats, including one recipe that requires this caramel sauce (did you see it on my @AmyBakesHealthy Snapchat? ), so be sure you make it before then! 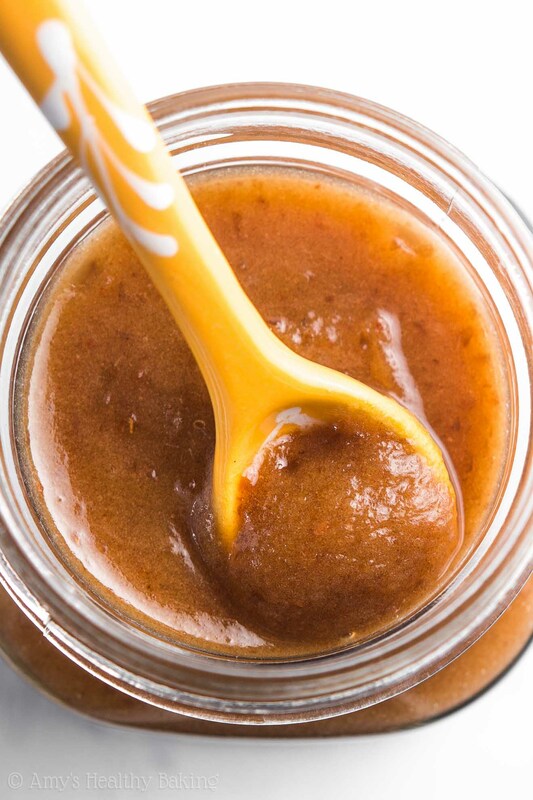 This healthier caramel sauce is incredibly easy to make! It will last for at least one week, if not closer to two, if stored in an airtight container in the refrigerator. 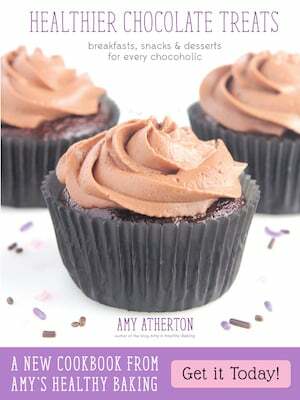 Add the dates and ¼ cup of water to a high-powered blender or food processor. Blend until fully combined. Gradually add more water, 2 tablespoons at a time, until the sauce is smooth and reaches the consistency of honey. Transfer to an airtight container, and chill until ready to use. Notes: It's more common to find medjool dates with the pits still inside at the grocery store, but it's really easy to remove the pits yourself! Do not use dried medjool dates; the caramel sauce will not have the same smooth consistency. 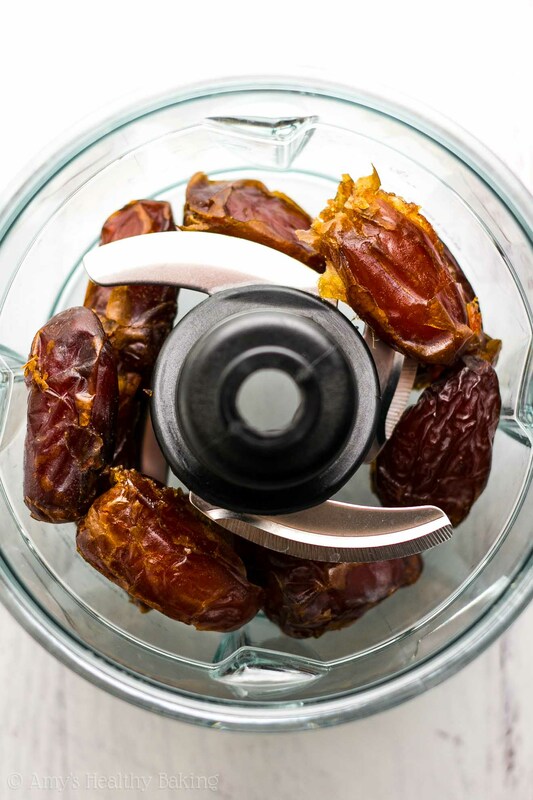 You may need to adjust the amount of water depending on your blender or the texture of your dates. 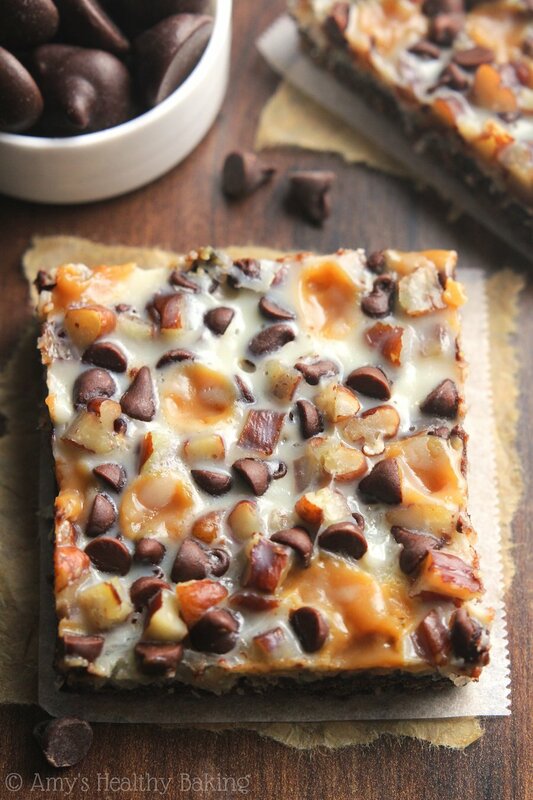 The consistency of the caramel sauce should be similar to that of honey. The sharper the blades are on your food processor or blender, the smoother the caramel sauce will be. I own and highly recommend this Ninja. It’s one of the more affordable high-powered models on the market. Hello! I wanted to ask if I could use this to make caramel milk? Or will the milk and sauce not mix well enough? 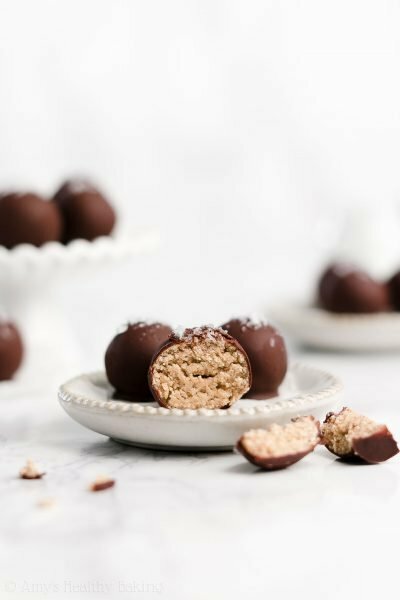 Will this work as an alternative to caramel for my cola copycat recipe? I really appreciate your interest in my recipe, Trevor! I haven’t personally tried substituting this caramel in anything like that, so I honestly don’t know. And I don’t want to lead you astray! 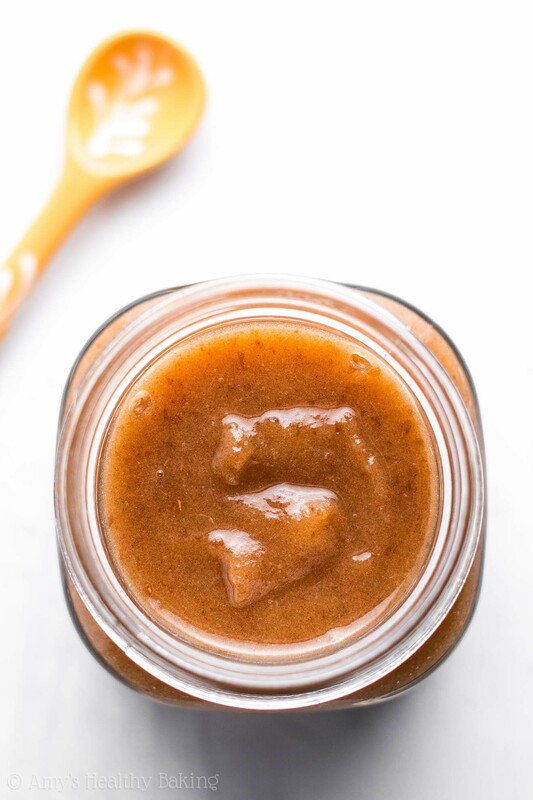 🙂 I’d love to hear what you think if you decide to try this homemade caramel sauce!